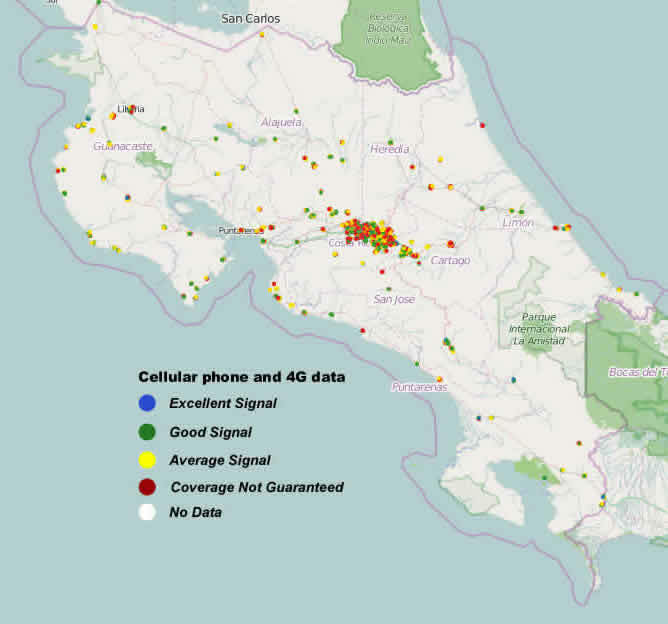 If you haven’t already you’ll want to determine if your phone will work at all in Costa Rica. 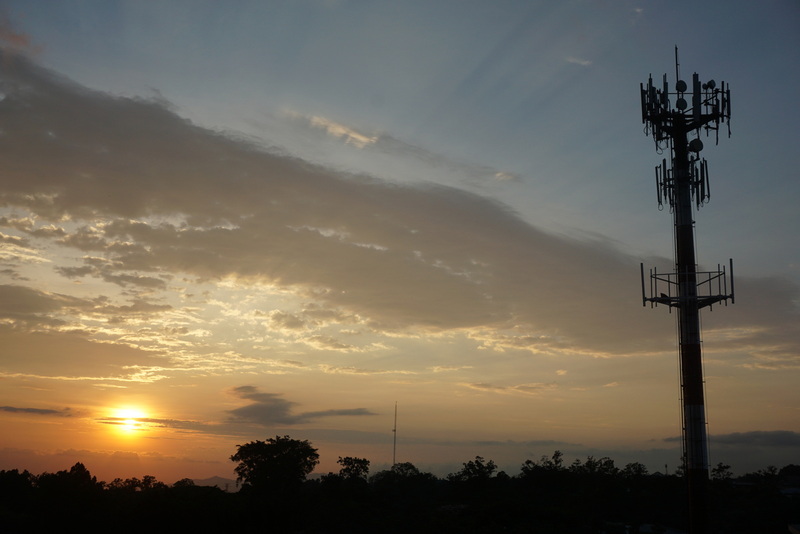 Cell phone signals in Costa Rica are a bit like the wildlife, you never know what you’re going to get until you get there and it could be there one minute and gone the next. One of our favorite spots on the Nicoya Peninsula is a remote house on Sand Dollar Cove at the far north end of Playa San Miguel. There is cell phone and even data service available if you wait for low tide and walk out on the beach to the edge of the surf. As you can see from the map of signal strengths above service follows the main roads as it does everywhere in the world. What’s not quite so obvious is that there are some very popular tourist destinations with intermittent and scattered signal or no service at all. 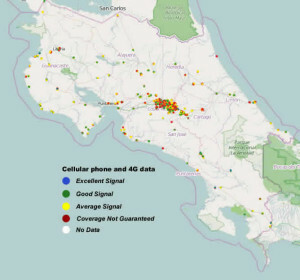 Except for little clusters of green around the Papagayo Resort area, Tamarindo Beach and Nosara the Pacific coast of the Nicoya peninsula (northwest) is mostly red or white meaning there may be service but you’ll probably have to hunt for it on top of hills or out on the beach. The Osa Peninsula in the southwest is much more dramatic and the Pacific coast where Corcovado National Park and the eco-lodges where tourists stay to see the wildlife and enjoy the beaches is completely cell phone free. These maps were created by the national phone service ICE and are based on data sent from phones connected to the network. 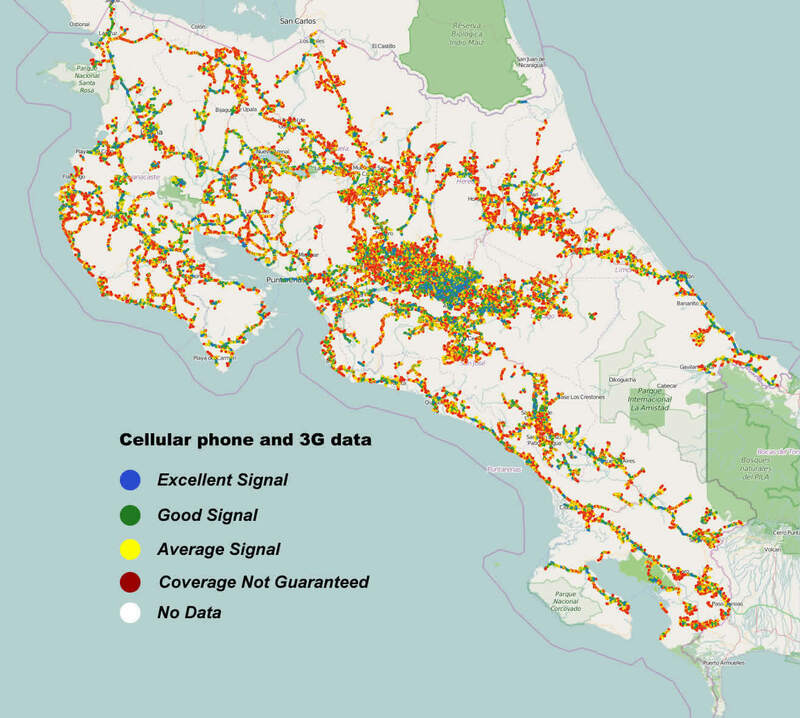 White areas where there is no data don’t necessarily mean there is no signal there. It just means no one with a cell phone went to that spot and used it over the time the data was collected. There may be great signal in some of the white zones but there are no roads there so you’ll have to walk to talk. Conversely, just because there are a bunch of green dots in the area you plan to stay doesn’t mean you’ll have signal at your hotel, resort or lodge. There are a lot of hills, mountains, ridges and forests in Costa Rica. These can all block signals locally and while the lodge 100 meters up the beach might be four bars it’s possible the only bar at your hotel is the one serving drinks.